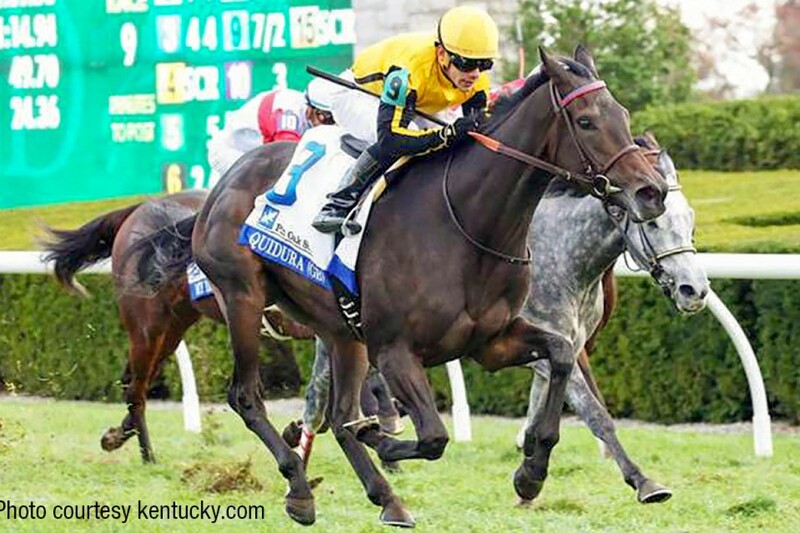 Gestut Fahrhof’s homebred Quidura (GB) put away rival My Impression (Sky Mesa) and drew clear in the straight to win the G3 Pin Oak Valley View Stakes, the feature race at Keeneland on Friday, by a length and a quarter. Content to sit just off the pace in fourth through the early stages of the race, she began her rally on the far turn, closing steadily on the frontrunners while moving three-wide out in the centre of the turf course. At the top of the straight, the three-year-old daughter of Dubawi drew alongside leader My Impression; the pair matched strides briefly before Quidura set sail for home, cruising under the wire a determined winner. The Valley View marked the first Graded victory for Quidura, who remains perfect in two North American starts and she has now won three of four career starts. Bred in Britain, Quidura is a half-sister to the German Champion Querari (Oasis Dream), winner of the G1 Premio Presidente Della Republica and now at stud in South Africa, and the G3 Bavarian Classic winner Quasillo (Sea The Stars), out of the Stakes-placed Quetena (Acatenango), a daughter of Quebrada (Devil’s Bag), a Champion Two and Three-Year-Old Filly in Germany – EBN.